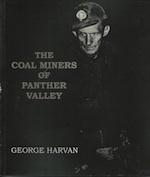 George Harvan, the pre-eminent photographer of the Anthracite regions of eastern Pennsylvania, has documented the life in the lines, below ground an above, for over forty years. Like no other medium, his work captures the spirit of the miner's lives. It is an evocative testament to the fellowship, the difficulties, and the dangers present in the mines and mining communities. Professor Thomas Dublin's informative essay on two hundred years in the Panther Valley places the photographs in their historical context.